This year Nuun will also be working closely with ‘celebrated two-time Olympians who will be training and racing with Nuun Endurance while they challenge themselves in their latest athletic pursuits.’ Track & Field World Championship Silver medallist and 2:24:52 road marathoner Kara Goucher recently announced her trail running debut at the Leadville Marathon. Nuun Endurance will play a role in her training for and performance along the lung-busting course. Meanwhile, three-time ITU Triathlon World Championships medallist Sarah True was the first-placed American female at her 2018 IRONMAN Hawaii debut. She will be using Nuun Endurance as she seeks the coveted Kona podium. Also, newly signed Nuun athlete and 2016 Mountain Bike World Championship Silver medallist, Lea Davison will be bringing Nuun Endurance with her on the road to Tokyo 2020, her third Olympic Games. The formula for Nuun Endurance was developed in partnership with world-renowned exercise physiologist and sports nutritionist Stacy Sims, PhD. Utilizing her hydration research, the product is optimized for the added physiological stress the body endures during long-distance (over ninety minutes) and high intensity exercise. 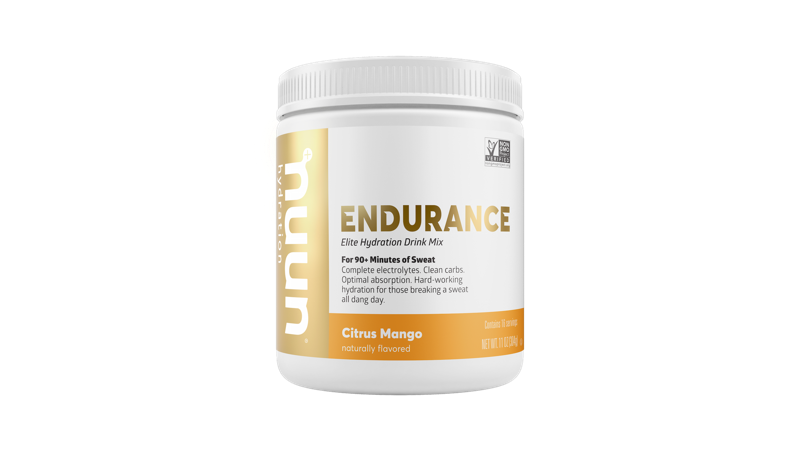 Nuun Endurance is comprised of multiple carbohydrate sources and electrolytes in specific quantities that seek to maximize the absorption of fluids and nutrients while minimizing gastric distress. Like all Nuun products, Nuun Endurance is third party verified non-GMO, Informed-Sport and Kosher, in addition to being vegan and gluten-free. The line is available in four flavours: Mixed Berry, Citrus Mango, Lemon Lime (REI exclusive) and caffeinated Strawberry Lemonade. The caffeine is sourced from organic green coffee beans at 25mg per serving. Nuun Endurance is available in an 11 oz, 16-serving canister for US$19.99. Single serve sachets are sold for US$1.99. Nuun Endurance will be on the shelves throughout the spring at major retailers in the United States including REI, Fleet Feet Sports, Jack Rabbit, Sports Basement, Road Runner Sports, in addition to other run, bike, and outdoor specialty stores. Nuun Endurance will debut to the endurance sports communities via Nuun’s expo presence at the Boston Marathon on April 12-14 and Sea Otter Classic on April 11-14.